Support for the overall package was extremely high: 68% among Democrats and Independents and 75% among Republicans. But the breakdown in the chart above ought to give all of us lefties pause. It’s great to see that extending unemployment benefits polled higher than any other element of the plan, but not so great that bonus tax cuts for the rich polled considerably higher than cutting payroll taxes. Obviously wording can be an issue in polls like this, and it’s notable that the tax cut question didn’t provide a choice of supporting only the broad cuts but not the additional cuts for the rich, and also notable that the estate tax question didn’t mention that estates under $3.5 million would be tax free in any case. On the other hand, the tax cut question specifically called out “wealthy people” and the estate tax question specifically mentioned an exemption of $5 million. So it’s not as if people didn’t have some idea of just whose taxes were being cut here. 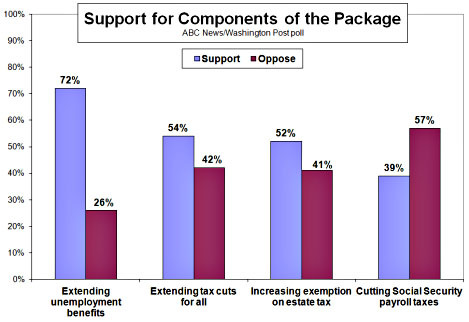 But the payroll tax cut, which would specifically benefit the working and middle classes, only garnered 39% support. So what’s going on? Why are so many more people in favor of an estate tax cut they’ll never see but not in favor of a payroll tax cut that will put immediate money in their own pockets? Possible answers: (a) people don’t really understand that cutting payroll taxes means they’ll see an immediate increase in their take home pay, (b) people associate payroll taxes so strongly with Social Security solvency that they don’t want to cut them, (c) people fantastically overestimate how likely they are to have a $5 million estate when they die, (d) lots of people have a strong instinctive view that people should be able to pass on their wealth to their kids no matter how much it is, (e) people are just generally confused about all this stuff and it’s hopeless to try and figure out what’s really going on. In any case, I’ll say this again to wavering lefties who have suddenly decided that the tax deal is no good because the payroll tax cut will never be undone and Social Security’s finances will be decimated: yes, Republicans will engage in their usual Democrats are raising your taxes! demagoguery when the tax cut expires next year, but no, it won’t be very effective. There are lots of good reasons for this, and this poll provides evidence for one of them: the public isn’t all that keen on cutting the payroll tax in the first place. They want Social Security fully funded, and that argument, in the end, will carry the day. Never underestimate the power of AARP.